The otherwise serene park-like landscape of North Lovers Avenue will explode with life during the first nights of Chinese New Year as up to 10,000 people arrive for Zhuhai City's fireworks displays. 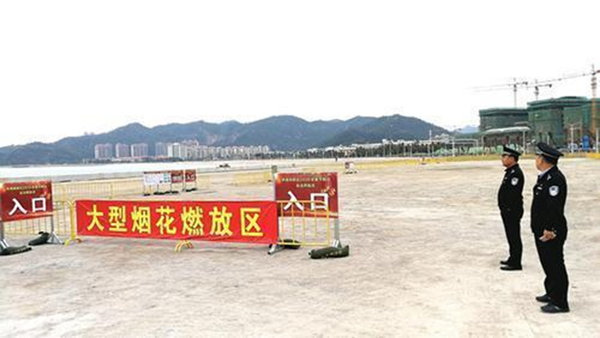 In preparation, the Zhuhai National Hi-Tech Industrial Development Zone in Tangjiawan has designated areas for parking 2,000 vehicles, observation, and detonations of both small and large fireworks in separate areas between Jishan Road and Kingsoft Software Park. There are two sites with portable toilets and two places to purchase firecrackers and fireworks. Safety and air pollution concerns have been addressed. Just prior to the onset of fireworks, a 2-km (1.24-mile) section of the avenue will be closed to traffic. Bus riders should get off at the traffic light in front of Sun Yat-sen University Zhuhai Campus or at the intersection of Baibu Road and North Lovers Avenue. Police will guide spectators to the viewing area. For the first time, authorities will use an eagle-eye monitoring system. The Public Security Department will utilize facial recognition technology to identify criminal suspects in real time and to monitor the number of visitors. Designated set-off times are from 8 pm on Monday, Feb 4 to 1 am Feb 5, and from 7 pm to midnight on Feb 5, 6, 7, and 19.